Completed in 1915 on the occasion of the 500th anniversary of the death of Jan Hus, the Czech Hussite reformer, this massive monument dominates the square. It shows two groups of people, a young mother symbolizing a national rebirth and the figure of Hus emphasising the moral authority of the man who gave up life rather than his beliefs. 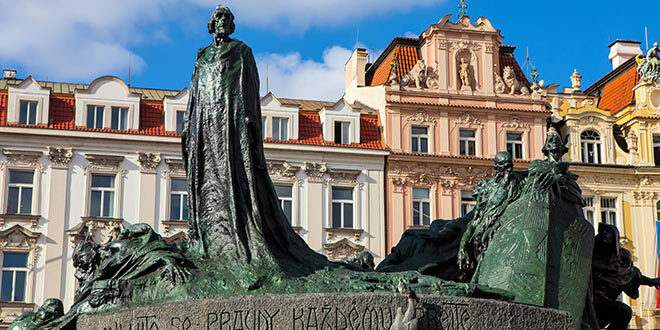 Master Jan Hus – is one of the most striking figures in Czech history. Hus was born in the small village of Husinec in South Bohemia, graduated from the Theological Faculty of Prague University, and later became its rector. At the time he was one of the greatest thinkers in Europe. He preached in the Bethlehem Chapel about putting right problems which had developed in the Church, and about returning the Church to its original beliefs such as modesty and recognising the bible as the single religious text. He criticised corruption in the Church, rife at the time, and wrote many works on reforming the Church which later formed the basis for the reform movement in Germany under Martin Luther. This Bohemian thinker and reformer of the Church was labelled a heretic for his opinions and in 1415 was burned at the stake by the Council of Constance. Even while at the stake, he did not recant his teachings. Hus’s death was one of the impetuses for beginning the Hussiterevolution, which affected not only Bohemia but a large part of Europe. 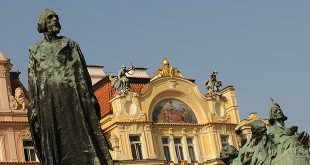 This is a great memorial to Jan Hus right in the centre of Prague. I am inspired by the contribution that this man made to our history.